There is nothing more frustrating than trying to take a photo with your smartphone and finding that its internal storage is full. It’s a surprisingly common problem — and although Google(s goog), Apple(s aapl), and Amazon(s amzn) have tried to crack the cloud photo conundrum, nobody’s gotten it quite right. That’s why StreamNation, a cloud storage firm, has released Shutter, a camera app that promises one thing: Every photo taken on your phone, uploaded to the cloud, for free. The good news is that Shutter is a very nice app. It has an attractive design, and a very useful photo viewer, with an elegant way of providing photo details such as shutter speed and ISO while browsing. The camera itself is fast but somewhat minimal in terms of options: You can add filters and set the focus but you can’t control shutter speed or white balance or access other photography settings. iOS is opening up its SDK to allow full manual camera controls in the near future, so you could see this change in a future version of the app. But the important thing about the app is as soon as a photo is taken, it’s uploaded to StreamNation’s servers, which are accessible through a browser or a desktop app. 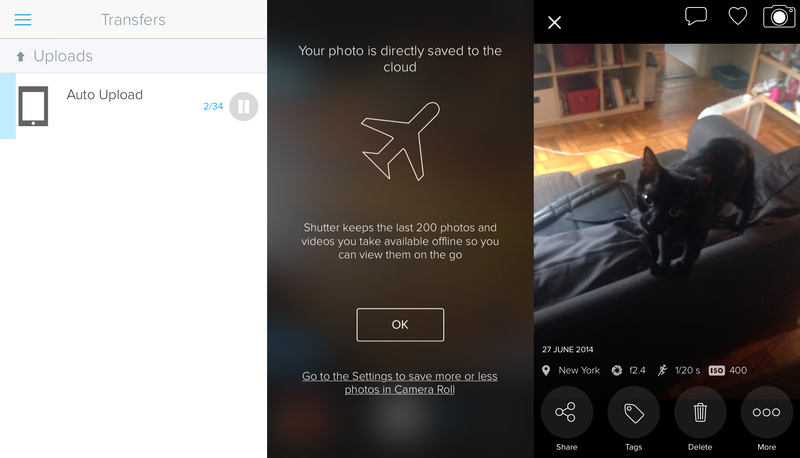 Like Dropbox, Shutter can even upload photos from the camera roll taken by other apps. Shutter locally keeps the last 200 photos taken on the camera and deletes the rest as soon as they’re uploaded. While I would’ve liked to see a feature where the most recent photos are stored on my phone in a lower resolution format, Shutter’s approach is a good compromise to the problem. Currently, I use Dropbox on iOS to upload my photos to the cloud and off my phone. But on a free account, Dropbox limits you to 5GB of storage. Apple’s no better, even with its forthcoming iCloud Photo Library and iCloud Drive, which also has a 5GB free cap. Google’s background upload to Google Plus is very well implemented but still has a total storage cap, and the kind of people who can’t be bothered to clear out their camera roll most likely do not want to sign up for or use another social network. Google Plus stores lower-resolution versions of photos for free, but full-size backups still count against the 15GB Drive allotment. Amazon’s forthcoming Fire Phone offers unlimited photo uploading, but is yet to be released. The solution to this problem needs to both be free and uncapped: First, because the people it would help most are not interested in paying a monthly or annual rate for photo storage, and second, because with ever-rising megapixel counts on smartphones, regardless of whether the cap is 5GB or 15GB, it’s going to get hit, eventually. Although Shutter doesn’t do everything right, it gets those basics down. Shutter is a bit of a trojan horse for StreamNation: By marrying a decent camera app with unlimited photo and video storage, it’s hoping to gain some attention for its cloud storage service, which it does charge for non-mobile photo storage over 20GB. I’ve known people who’ve lost their phones and subsequently lost every photo they had taken in the past few years because they were never backed up. Shutter, which is available on the App Store today, is just simple enough to be a potential solution for them, although it would be simpler if it the exact same app was offered by Apple or Google.